Italy/ US/ Sweden, 2015, 90 minutes, Colour. Sarah Jessica Parker, Rosie Day, Raoul Bova, Claudia Cardinale, Paz Vega, Shel Shapiro. While all roads lead to Rome, this film does not provide one of the most significant of these roads! This is a romantic comedy for seniors and for people who are middle-aged although one of the central characters is a surly teenager. 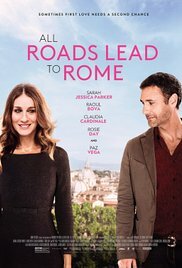 The opening is in New York but most of the action takes place in the Italian countryside and then in Rome; the leading lady, Sarah Jessica Parker, is American, her daughter, Summer, is played by Rosie Day, from England, Raoul Bova and Claudia Cardinale another Italian, Paz Vega is Spanish – and the director is Swedish. The action takes place over two days, mother taking daughter to Italy to get out of the clutches of a callous boyfriend who wants her to take the rap for drug bust. mother, a journalist and now divorced, wants to go back to where she spent two happy months in the past and to encounter the man she was attracted to but ran away from in that past. However, much of the action focuses on the man’s mother, played with zest by 75-year-old Claudia Cardinale who wants to escape from her son’s control to marry the man with whom she performed songs in the band 50 years earlier. She and Summer take the car to get to Rome for the wedding, the adults in pursuit. The film become something of a media sensation with Paz Vega as a journalist. Nothing startling, a time-passer, pleasant but Summer is particularly irritating until she learns her lesson, calms down and breaks with the no-good boyfriend. 1. A romantic comedy for middle-aged audiences and seniors? 2. New York settings for the opening, American flavour? The flight to Italy? The Italian countryside and its beauty, the homes, the roads, kiosks, police precincts, churches? Rome, the city, the streets, the church? The musical score – and Italian songs and style? 3. The title, Americans going to Rome, the Italian response – and a Swedish director? 4. Maggie, Sarah Jessica Parker, her age, experience, journalist, the divorce, concern about her daughter, Summer, her entanglement with Tyler and being prepared to take responsibility for his drug bust? Her background and the setting free of the rabbits? Her record? 5. Summer, her look, piercings, pink hair, resentment towards her mother, in love with Tyler, prepared to take the rap? Her behaviour on the plane, criticism? Attitude towards her father? Her intention to go back to America? At passport control, her mother lying – and the later use of this record against Summer? 6. The car, driving, the tension between the two? The phone, Maggie throwing it out the window? Arriving, the encounter with Luca? Maggie and her memories, the two months in Italy, falling for Luca, yet going home, marrying? His welcoming them, the ceramics? The presence of his mother? 7. Carmen, Claudia Cardinale, wilful, wanting to leave, her son controlling her? Summer wanting to leave, the passport, the keys of the car? The two travelling together, initial antagonism, getting to know each other? Stopping for coffee, Summer wanting to get away, Carmen with the keys? No petrol, the men with the chickens, stealing, pursued? Maggie and Luca and the pursuit? 8. Maggie and Luca, reminiscing about the past, tensions, the pursuit? Maggie as a controller? Taking the car? 9. The police reports, the television story? Luca and his contacting Giulia, the photos, on the television, accused of kidnapping Carmen? 10. The police, the interrogations, not believing? The holding of the case, the panel, watching the television, Maggie and Summer set free? The meeting with Giulia, her help? 11. Carmen, meeting up with her lover, the memories of the past, the singing together in the 1960s? The later visualising of this? 12. The church, the priest, the interruption, Carmen hitting her head, hospital? Reconciliation with Luca? Maggie seeing Luca with his daughter? 13. Summer, her phone call to Tyler, realising he was using her, hanging up on him? 14. The wedding ceremony, the groom and his happiness, calm and happy? The celebration? 15. Final credits and everybody singing and dancing?